How does the VHD file know to what WIM file it is connected and what occurs when using Upd WimBoot button ? 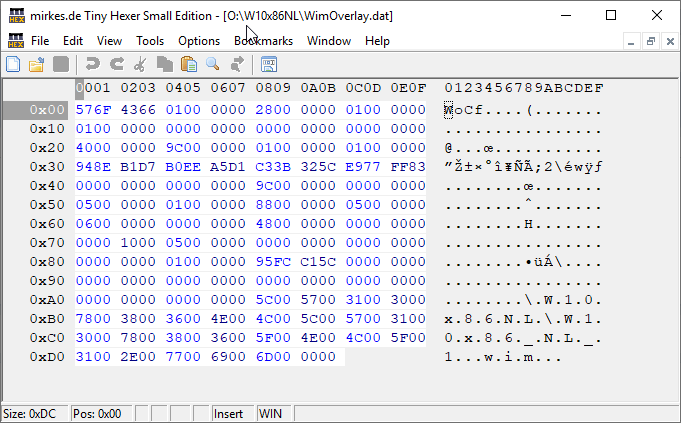 You can open the VHD in 7-zip and then Copy the file WimOverlay.dat to a place where you can watch the binary content of this file by using TinyHexer. It shows the WIM File path and the MountedDevices registry entry with the Disk Signature of the Drive where the WIM file is located. Can you post a sample WimOverlay.dat? It should be trivial to make a Structure Viewer for Tiny Hexer or a direct parser for that file. Sure, it is certainly very interesting. The good news are that seemingly only you and me were unaware of this mechanism . In addition, this option works best when running on Windows 8.1 Update 1 or later, since that is the first version of Windows that contains the Windows Overlay Filesystem filter driver ("WOF"). If the WOF driver is detected, wimlib will create the WIMBoot "pointer files" using documented ioctls provided by WOF. Otherwise, if the WOF driver is not detected, wimlib will create the reparse points and edit the file "\System Volume Information\WimOverlay.dat" on the target volume manually. This is potentially subject to problems, since although the code works in certain tested cases, neither of these data formats is actually documented by Microsoft. Before overwriting this file, wimlib will save the previous version in "\System Volume Information\WimOverlay.wimlib_backup", which you potentially could restore if you needed to. The format is not documented. I'll see what I can do with this latter info. WimOverlay.dat uniquely identifies the WIM File. Yes, in fact I have tested it. EDIT: But if I attach the VHDs and run in Power Shell: Get-WIMBootEntry -Path "J:\" Only got the wim file path, not any mention to the respective index. I was thinking the other way round. and rename the "current" \System Volume Information\WimOverlay.dat to \System Volume Information\WimOverlay.dzt and any of the other ones back to \System Volume Information\WimOverlay.dat. This would probably be possible through a batch grub4dos script running at boot time. Then I got: I:\Wimboot\10-WB.wim:2 the full path and the image index, 2 in this case, attached images of Power Shell and Command prompt. I made this before copy the VHD because if I want to only Ramboot and then make a LZ4 compressed VHD (only can be loaded in Ram, and only work if made from a fixed size VHD) it is faster to do it on the HD, and latter copy to USB only the 10x64-WB.vhd.lz4 (130 MB) and 10x86-WB.vhd.lz4 (99.2 MB) as required (and not the full 1.5 GB for each fixed size VHD). Or if for any reason I want to be able to also boot from bootmanager and not only Ramboot the OSs (very improbable for me since Ramboot is IMHO the best and fastest option) then I need to make and/or copy 480 MB for the expandable 10x64.vhd and 360 MB for the expandable 10x86.vhd. K:\Wimboot\10-WB.wim is the wim file already copied to single primary (NTFS) partition of my external USB device. All BCDs and grub4dos menus were made manually. So just applied this command to 10x86.vhd and also the same to 10x64.vhd to relocate the files. By the way I have a new addition to moded WimBootCompress-2019-03-31.ini (attached). \MSOCache\* >>> This is the hidden cache folder after installing Office (saving to compress in your wim file from about 300 MB to almost 1 GB, depending on version), sometimes it may be created on other partition if available. VHD_WIMBOOT will attach the selected VHD file and then exactly use the same code to Update WimBoot the VHD for the selected WIM file. Thanks for the new WimBootCompress.ini file that also excludes MSOCache folder. I had a hard time trying to make version 2.0 work as well as version 1.8; started thinking there was something wrong with my vhd+wim baking or my actual files, as 2.0 would not complete bcd tasks and gave a lot of registry copying errors. I resorted to 1.8 back again, and everything went back to normal. no issues at all. do not know if I am the only one to have noticed that, but I can assure u it was a bit of a headache. There is something "wrong" (or I am completely failing to understand it in the wimlib notes) in the format, I tried to do my best to adapt the Structure Viewer to the sample provided, but it needs some serious checking against a number of different Wimoverlay.dat files, particularly to check if both the "MBR" and the "GPT" data are parsed correctly. I found a 40 bytes section that is seemingly missing from the wimlib document and - maybe - I found how to determine the offset and size of the path. Thanks for making the WimOverlay.mps script for TinyHexer. The mpth_small.exe version of TinyHexer that I normally use, does not have the Structure Viewer. 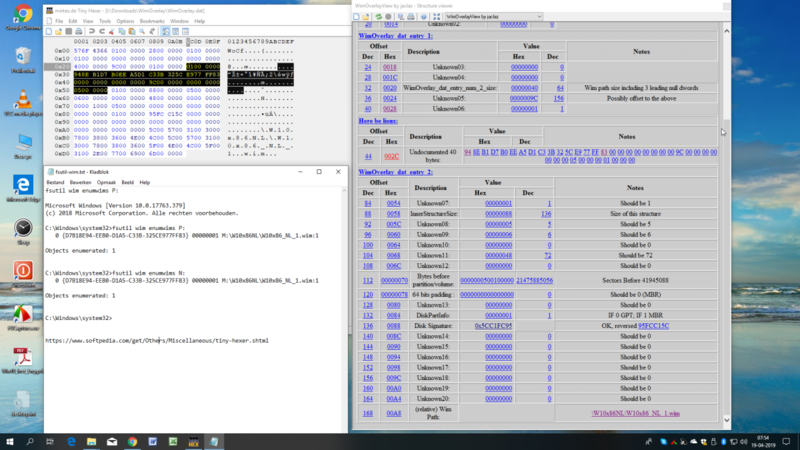 The 40 bytes section in WimOverlay.dat being undocumented contains at offset 0x30 a 16 bytes guid that identifies the WIM file.